It's another great year for those working in tech, as salaries across every vertical saw significant increases. Here are the average tech salaries for 2016, according to data from Robert Half Technologies. In particular, the salaries you offer must be kept at least on par with those of other firms in your industry and geographic region. But to do that, you have to stay continually up to date on what your competitors are offering. 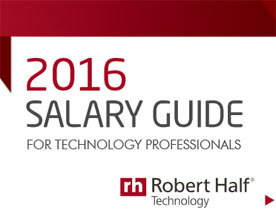 To help you benchmark your compensation levels, Robert Half Technology releases a Salary Guide every year, complete with the most current information and advice on starting compensation, workplace issues and the hiring outlook.